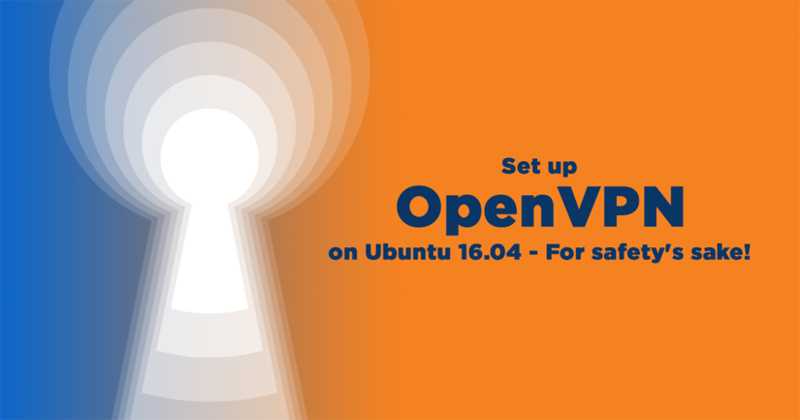 Set up OpenVPN on Ubuntu 16.04 — For Safety’s Sake! It’s a dangerous world out there on the public internet. Here’s how to make it safer for you and your users. Want to know a really scary IT statistic? Xirrus, a leading Wi-Fi company, recently polled more than 2,000 executives and IT professionals. They found that while 91 percent of respondents know public Wi-Fi is insecure… 89 percent go ahead and use it anyway. One thing you can do to help clean up this security mess is to provide a virtual private network (VPN) so that your users’ traffic gets protected before hackers can get their digital mitts on it. There are many VPN servers, but OpenVPN is my VPN server of choice because it’s very popular, easy to use, and widely supported. When integrated with OpenSSL, OpenVPN can encrypt all VPN traffic to provide a secure connection between machines. Better still, it’s easy to set up your OpenVPN server to forward internet traffic. Finally, but not least, OpenVPN works well on almost all devices. You can run OpenVPN on pretty much any Linux server, but in this post I’m going to be talking about the latest long-term support (LTS) of Ubuntu Linux: Ubuntu 16.04. Familiarize yourself with Linode’s Getting Started guide and complete the steps for setting your time zone. This guide will use sudo wherever possible. Complete the sections of Linode’s Securing Your Server guide to create a standard user account, harden SSH access and remove unnecessary network services. Do not follow the Creating a Firewall section–this guide has instructions specifically for firewall rules for an OpenVPN server. Next, we’re going to install the OpenVPN Community Edition. In this, server and client configuration files are manually edited and client credentials are copied to their target devices. Another way of doing this is with the commercial uses OpenVPN Access Server. This is a server-side application which lets you configure OpenVPN through your web browser. Client machines use a private URL to download their security credential packages. If you are interested in running OpenVPN Access Server, see the Linode guide: Secure Communications with OpenVPN Access Server. For your network, like it or not, you’re going to be using IPv4 for your VPN. OpenVPN 2.4 will support both IPv4 and IPv6 at the same time, but it’s not ready yet. We’re running out of IPv4 addresses, but it’s still the most common network protocol, so you’ll be running with it. “Tun,” you ask? That’s the virtual interface between the OpenVPN daemon and your Linode’s eth0 network interface.. Note that you shouldn’t leave this user logged in when you’re not actively working. If you need to log out of root before completing this section, enter the command, exit. The permissions of /etc/openvpn/easy-rsa/keys are 0700, which do not allow for group or world access to the key and certificate files. For this reason, keep keys as the storage location for server credentials by specifying the absolute paths in OpenVPN’s server.conf. 4096 will be created in the next section, so expect your default server.conf to look a little different. # Substitute 4096 for 1024 to use 4096 bit keys. Notice how we’re using 4096 instead of the default 1024? As computers get faster, it gets easier and easier to crack encryption codes. The longer your keys, the more sturdy they are against hackers. This is more secure than the default Blowfish-128 cipher. To further harden your OpenVPN from attackers, you should require keyed-hash message authentication code (HMAC) to be identical. This requires that any HMAC packet signature in the TLS handshake between the server and connecting clients be identical. To do this, uncomment the line by removing the “;” (semicolon) at its beginning. tls-auth ta.key 0 # This file is secret. Finally, restrict the VPN’s control channel to strong cipher suites. It is recommended to be as restrictive as possible here, but not all cipher suites can be used with all versions of OpenVPN. Save and close the server.conf file. You now need to create the pem file we inserted earlier. Last, but never least, OpenVPN has this nasty habit of running as root. Nothing should run as root unless you have no other choice. Uncomment the user and group lines, and edit user with the username above. This tells the daemon to drop root privileges and switch to the openvpn_server user after startup. OK. OpenVPN is now ready. Let’s give it some certificates, so it can start securing your communications. You don’t need to use all of those keys, but what you can’t do is use one and leave it blank. Bad things will happen. A root certificate is the certificate used to generate client keypairs. At each prompt, add or edit the information to be used in your certificate (or leave them blank). When you’ve completed the question section for the private key, confirm the signing of the certificate and the certificate requests certified by answering “yes” to those two questions. Each client needs a configuration file defining the OpenVPN server’s settings for it. It’s a good idea to keep a copy of your client config file on the server as a template in case more clients are added in the future. It cannot be located in /etc/openvpn, because then the OpenVPN daemon won’t know whether to load client.conf or server.conf. For this reason, you should store it in the keys folder with the other client files, even though the file does not need to be kept secret. You could use a hostname, but since all Linodes have static public IP addresses, it’s a bit more secure to to connect by IP and bypass the DNS lookup. Further down in the /etc/openvpn/easy-rsa/keys/client.ovpn file, edit the crt and key lines to reflect the names and locations on the client device. Specify the path to the files so they, and client.ovpn, will not be stored in the same folder. These are then ready to ship to your users. Windows will need 7zip to extract .tar files. You can also use the package zip to create a .zip archive, which can easily be opened on almost any operating system. These commands will scan the /etc/openvpn directory on the server for files with a .conf extension. For every file that it finds, it will spawn a VPN daemon (server instance), so make sure you don’t have a client.conf or client.ovpn file in there. You’re now ready to start securing your users — whether they’re working down the hall or down at Joe’s Barbecue. Please feel free to share below any comments or insights about your experience securing a server using OpenVPN. And if this blog was useful, consider sharing it through social media. About the blogger: Steven J. Vaughan-Nichols is a veteran IT journalist whose estimable work can be found on a host of channels, including ZDNet.com, PC Magazine, InfoWorld, ComputerWorld, Linux Today and eWEEK. Steven’s IT expertise comes without parallel. And while his views and cloud situations are solely his and don’t necessarily reflect those of Linode, we are grateful for his contributions. He can be followed on Twitter (@sjvn).